POLL: Bungalow - love or loathe? 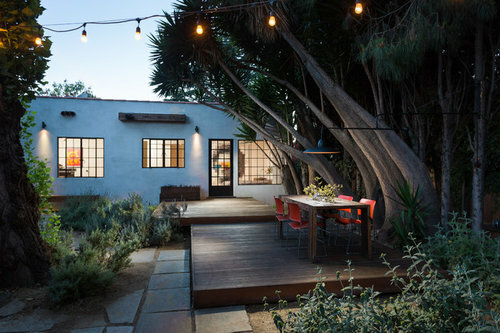 Often reserved for holiday homes and the elderly, the much maligned bungalow never has it easy, but we've seen plenty of evidence on Houzz to suggest the bungalow is back and better than ever! But is it just us? What do you think of the bungalow? Let us know below if you love or loathe it! I grew up in Australia and like some other people said, they are just called houses. I hope to move to one soon. A bungalow in Australia is a little building in the back garden set up as guest accommodation or a games room for the kids etc. Our current house is an Edwardian 3 storey with cellar, so 4 levels in total. I hate the stairs, they are too steep. I hope Brits continue to dislike bungalows to keep the prices down. I grew up in bungalow and would love to live in one now. When all rooms are on the same level you feel you're living in a bigger space, and no noise from upstairs either! Also no lugging hoovers up n down stairs. All in all just easier living. 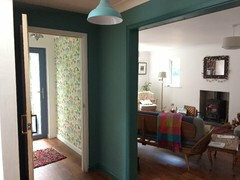 I moved to a bungalow two years ago and I absolutely love it, it's large modern and very spacious, I have an orangery which leads off the kitchen and overlooks the garden and to the side a large wooded area (80 trees) that is covered with bluebells in the spring, we plan to cover this area with wild flowers this year. Everyone that has visited us here loves it as much as we do, bungalows don't have to be little square boxes. Personally I 'don't feel right' unless I've walked upstairs to bed! We built our own bungalow 30 years ago, I was the labourer to my husband a builder by trade. 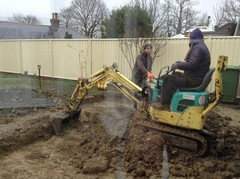 I also designed the house and apart from the wiring it's all our own work. We do have stairs, a spiral staircase leads to bedrooms under the eves and a handy extra bathroom. It's a part of us and we love it. Our house was described as an Executive Bungalow when we bought it ten years ago - not sure what that is though! Essentially the house is built on a slope, with the living quarters all on one level and the double garage under the far end of the plot where the ground slopes away. 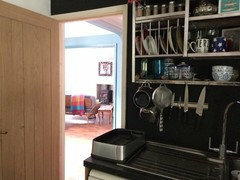 I love it as the kitchen and living room are at one end while the bedrooms are away from the hubbub at the other end. I used to be a confirmed bungalow hater but lately I've been changing my mind (and I don't think it's an age thing!) It began after I was laid up with a neck problem, which doesn't sound that serious but was totally debilitating, and I spent the best part of a week propped up watching Homes under the Hammer and any other available home programmes. There were a number of 1920s and 30s bungalows featured and they were rather charming with some lovely period features and full of potential (largely unrealised on HUTH but that's not unusual, I spend a lot of time shouting at the TV when it's on ;) I then saw some very interesting makeovers both inside and out of more (and different era) bungalows online and on design programmes and was forced to revise my opinion. Even some of the rather uninspiring looking varieties usually sit on a good plot and can provide very versatile accommodation with room to extend if needed. I think the days of buying them for the land and promptly demolishing them may be numbered. Bungalows offer varied living but some clients of mine want that additional space. Much easier to create that additional space above and to the sides than it is with a conventional town house where other buildings encroach, access is often poor and plot sizes are less generous. The other advantage I think is that the architectural merits of the average UK bungalow are virtually non existent so you can more or less adapt them to your own tastes without feeling guilty. ...and I never thought I would say this but...living in a cul de sac with more than a dozen bungalows of various shapes and sizes, all individually customised by their loving owners and including everything from fake cladding and stone herons to restrained wood and beach house pebble gardens, cheek by jowl, in a way that would horrify the good taste police, actually makes me smile and value the quirkiness of English eccentricity. There is something to celebrate here - freedom of self-expression for example. Planning departments do not seem to care particularly about bungalow-ville. Much more complex and visually interesting than acres of new build grey-blue and larch cladding where one plot is disorientatingly indistinguishable from another. coolerplanet - it really says something about human nature and how perverse our planning 'givens' are in this country. People as individuals from all walks of life crave to express themselves and their individuality, and yet we have to put up with the planning tyrants imposing 'saminess' on every neighbourhood. Why does 'in keeping with the neighbourhood' count more than good design? And why should a bungalow be adjacent to another bungalow, why does a row of houses have to be the same height, shape, materials, etc.? I grew up in South Africa where it is usual for houses (whether single or multiple storeys) to be built one at a time, and any similarity in style is largely down to fashions at the time of building. It allows for a pleasing variety and some great expressions of creativity. I read once that when bungalows came into vogue in this country it was with some kind of aspirational nod to the star-studded Californian dream of the movies. However the execution of that concept in this country has been appallingly prosaic. Bungalows are not per se awful - some can be amazing (though you usually have to go abroad to see them) - but it's just the way they have been done here over and over again with total lack of imagination or flair that has given them a bad name. If planners were less draconian and planning law less stifling, imaginative well-designed houses and bungalows alike would be built. Here! Here! , cooler planet & jelliest. Agreed that the planning system here can be seen as inflexible, but like any system, once it is understood it can be modified to accept variations to normal expectations. We have found that if proposals are presented clearly and all planning policies addressed then a planning officer can often support some rather Maverick solutions. Obviously a full planning application and supporting documents are required to argue persuasively, but the cost can me mitigated if approached in the correct manner. Rules are there for the unimaginative.....but if fully understood they can be the key to achieving dreams. As a long time lover of all things house related I have spent many hours watching programmes about renovating, building, restoring (you name it I'll watch it!) houses and sometimes the air is blue with my views on the various planning departments involved. Whilst I fully appreciate the need to have some restrictions, particularly in conservation areas, sites of outstanding natural beauty or on listed buildings, they often come across as excessively interfering and sometimes both pedantic and irrational. I am particularly incensed when someone takes on a building of historic interest that is at the point of collapse, they fully intend to do their best by the building but not unreasonably would like some autonomy on how to turn it into a family home and end up driven to the brink of bankruptcy and a nervous breakdown by the planners etc who are still insisting on details that they simply can't afford. It would seem that losing the building forever is preferable to allowing any alteration they do not feel is sympathetic. Small wonder so many incredible buildings are still on the at risk register, as one woman emphatically said after an epic rescue that cost millions (and who wasn't even allowed to put in the kitchen floor of her choice) when asked if she would ever take on a listed building project again 'NEVER' . Gerry, were we separated a birth ? Dealing with regulatory bodies is about using the correct language specific to that body. I have also seen the programmes referred to but I must say that my experience over the last 24 years dealing with all the regulatory bodies is that if properly presented most projects can be realised. This approach has enabled me to be in the position to say that none of the projects in which I have been involved have been refused wether it be by Planning Authorities or Conservation Bodies. After photographing a beautiful contemporary bungalow, I am now seriously into lateral living spaces..
Bought my bungalow a couple of years ago and am nearly finished renovating, well on the inside at least! Spent half of my life living in bungalows and half in houses, so had the best of both worlds. Never thought that I'd actually buy one though but when I decided to move I came spotted this bungalow, it was dated but had good bones and space outside. I can see why some bungalows would get bad press but with a bit of imagination they can be transformed. One of the first things I did was remove two internal walls, so instead of having a tiny entrance lobby (you would have to pin yourself to the wall so someone could enter in!) and a small kitchen before entering into the living room, I now have a good size kitchen which is open to the living room. It's given me so much more room & light. LOVE! ...it completely depends on how you use the space you have and fill it with the things you love! Bungalows, Who enjoys vacuuming stairs! Yes I have a bungalow for sale close to seaside in Whitley Bay, North Tyneside, U.K. Its with Embleys estate agents and an absolute dream, ripe for either amateur or prof designer to mould to taste. I dropped the price because there's no point me changing kitchen, bathroom and decor to my taste. Its a snip! Enjoy! Thats one advantage of mine; wider hall than othets locally, big rooms, 2recetion rooms and 3 bedrooms. The builder was constructing for his own family. We love bungalows if they are filled with natural daylight. Great scope for natural lighting from above. Bungalows often detached too, which is ideal in terms of a 'buffer' space around you. Often scope for vertically extending and creating a contemporary aesthetic, so many opportunities presented by bungalows! Bungalows are great, no fiddly stairs to clean and going upstairs to forget what you went up for! 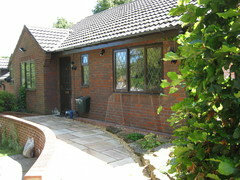 We are looking for a bungalow to retire to, partly due to my wonky knees but the majority of bungalows are ssssoooo ugly! Why can't someone design an attractive single storey dwelling? Further to my original comment, the only disadvantage with bungalows of a certain vintage can be horribly narrow corridors. Luckily ours is generously wide. In the eighties, there seems to have been an obsession with maximising bedroom sizes at the expense of a decently proportioned passageway. POLL: Colourful fireplace - love or loathe? POLL: Wicker furniture - love or loathe? POLL: Carpet - love or loathe? POLL: Interior windows - hit or miss? To separate the play room or not?